More than £3.5m would be needed to refurbish an old department store that was once at the heart of a Welsh town. 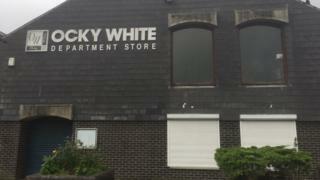 Ocky White was a popular Haverfordwest shopping mainstay for more than a century before closing five years ago. A report to Pembrokeshire council's cabinet said upgrading the Bridge Street building was "critical" to Haverfordwest's riverside regeneration. At a meeting on Monday, councillors agreed to buy the building described by one as a "blight" on the area. About £2.3m, including the £460,000 purchase price, will come from the Welsh Government's EU-funded Building for the Future fund. Councillor Paul Miller, cabinet member for economy, tourism, leisure and culture, told the meeting purchasing the building was part of a "wider plan" to redevelop the town. The Ocky White building renovation is one of Pembrokeshire's priority projects. The report said not regenerating the old department store would "lead to a failure to deliver much needed and strategically important town centre regeneration in the county town". It added that while the work would cost the taxpayer until the building is completed and fully let, there would be "financial and marketing benefits that will help re-position Haverfordwest as a destination retail centre". Supporting the plans, Councillor Tessa Hodgson said the former the store had become "dilapidated" and a "blight" on Bridge Street. However, Councillor Bob Kilmister said he was "not convinced" by the building plans, but to "do nothing" was not an option.